Some girls just don’t like to play nice or stay quiet. Some girls hunger for adventure, excitement and a good scuffle in the arena. They scoff at the idea of dressing up like a princess. They live for epic battles in the ring and the roar of the crowd. They’re not interested in having tea parties when there are still so many opponents to be fought and glory to be won! That’s why they need an outfit that will have them ready to enter the arena. They need the outfit of a true gladiator! 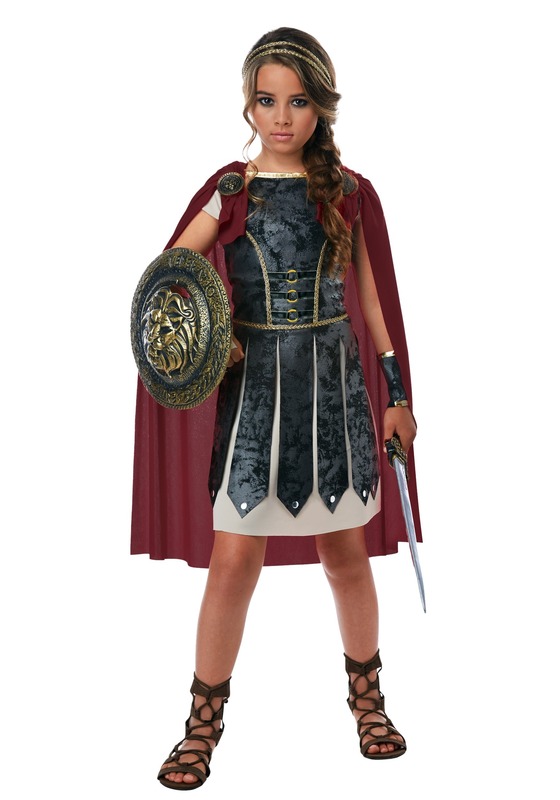 They need something a little like this girls gladiator costume. With a look inspired by the garb of ancient Roman soldiers, this child gladiator outfit includes a dress that features a faux leather exterior that mimics the look of real gladiator armor. The red cape will make her feel like the crowd favorite, as it adds a dash of flair that makes her stand out from all the other challengers. Once she has the entire ensemble on, you may just need to drive her to the Colosseum, because she’ll be ready for a fight against any foe. Just make sure you teach her all manner of skill involving the shield and sword, since she’s going to need every bit of martial skill she can muster to take on her opponents. Make sure to add our toy sword and shield set to your order to make sure that she’s fully prepared for her next bout in the ring.